Young German Shepherd puppies have an extremely high energy requirement. We, at Lundborg-Land German Shepherd Kennels feed Nutri Source Large Breed Puppy, Chicken & Rice Dog Food with about 1-2 teaspoons of raw beef, turkey, chicken or a good quality canned dog food to the mixture. (not all at the same time) You can also add yogurt if you like. You can rotate these choices. Please, please increase food as puppy grows. We feed two times a day, morning and night until the puppy reaches 5-6 months of age, then we switch the dog food to the adult formula and then feed only once a day. Always keep fresh water available at all times for your new puppy. No rawhide treats or greenies. Only provide “natural” ingredient treats. Please nothing made is China . Read the labels please. Lundborg-Land German Shepherd Kennels recommend and feed all of our German Shepherd adult dogs Nutri Source Adult Dog Food . We do not add any vitamin supplements as we feel everything has already been added for the German Shepherd needs for good skin, health and nutrition. We feed once a day for Adults and 2 times a day for Puppies, and supply clean, fresh water at all times. If you have any questions regarding the feeding schedule of your Lundborg-Land German Shepherd puppy or dog, please call us at (951) 443-4318. NutriSource® Large Breed Puppy Chicken and Rice Formula provides super premium nutrition in a scientifically formulated easy-to-digest food designed for puppies of breeds that will mature at more than 50 pounds. This is formulated to provide proper nutrition for balanced muscular and skeletal growth in large and giant breeds avoiding joint problems later in life. NutriSource® Large Breed Puppy contains specially adjusted levels of calcium and phosphorus matched with balanced protein, fat, carbohydrates and calories to supply large breed puppies the nutrition to grow and develop to fullest potential. Feed NutriSource® Large Breed Puppy food to your Large/Giant Breed Puppy from weaning until your dog reaches it’s mature weight and size, typically at about 18 months of age. 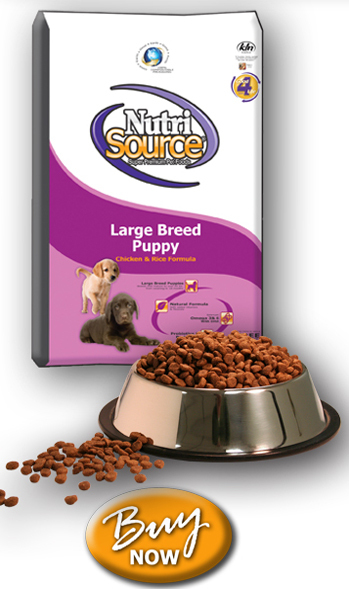 At maturity, we suggest transition to NutriSource®Adult or NutriSource® Large Breed Adult food. New and Improved – made with organic selenium and organic zinc – no wheat. Chicken, chicken meal, brown rice, white rice, barley, corn gluten meal, oatmeal, beet pulp-dried, chicken fat (preserved with mixed tocopherols), fish meal (a source of fish oil), natural turkey and chicken flavor, flax seeds, sunflower oil, dried brewers yeast, dried kelp meal, potassium chloride, dried egg product, salt, minerals (zinc proteinate, iron proteinate, copper proteinate, manganese proteinate, cobalt proteinate, selenium yeast), DL Methionine, vitamins (vitamin A acetate, vitamin D3 supplement, vitamin E supplement, niacin, d-calcium pantothenate, thiamine mononitrate, pyridoxine hydrochloride, riboflavin supplement, folic acid, biotin, vitamin B12 supplement), ascorbic acid (source of vitamin C), taurine, choline chloride, yucca schidigera extract, calcium iodate, rosemary extract, yeast culture (Saccharomyces cerevisiae), dried Lactobacillus acidophilus fermentation product, dried Enterococcus faecium fermentation product, dried Aspergillus niger fermentation product, dried Bacillus subtillis fermentation product.